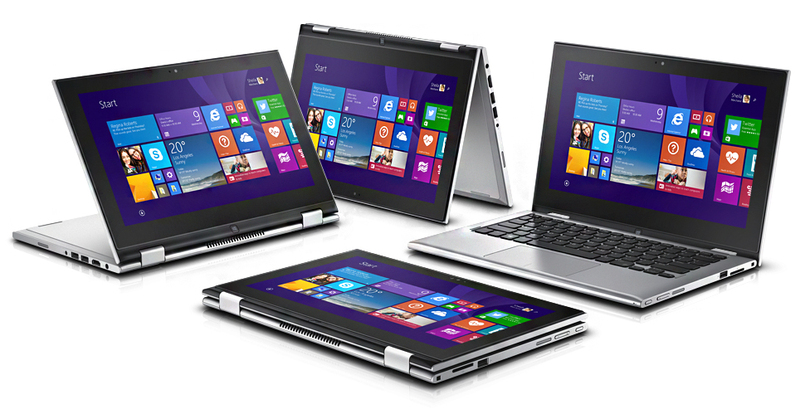 Dell cites a shrinking tablet market to boast its successful and fast-growing series of 2-in-1 XPS and Latitude notebooks. Apple will almost surely unveil a new iPad at WWDC 2017 tomorrow in San Jose, California to the usual fanfare and hype from the press. Dell, however, has released data belittling iPads and slate tablets to claim that the convertible 2-in-1 market is showing much more promise moving forward. Needless to say, Dell will be investing much more in detachables and convertibles than traditional Android or Windows tablets for the time being. According to Dell, shipments of its latest 2-in-1 devices like the XPS 13 2-in-1, Inspiron 5000 2-in-1, Latitude 5285, and Latitude 5289 have grown 29.9 percent YoY worldwide against the industry average of -10.2 percent during the same period. If broken down by region, Dell 2-in-1 systems have grown 69 percent in the U.S., 86 percent in China, and 177 percent in the UK YoY. The Texan manufacturer is making it very clear that productivity is substantially more flexible on devices that are notebooks first and tablets second and not vice versa. In this case, it would be difficult for us to disagree with Dell. Market analysts from IDC have tracked a 20.1 percent YoY decline in slate tablet sales for the ninth quarter in a row to suggest a saturated market of users who are unlikely to repurchase more tablets. The 2017 Holiday season should prove to be interesting as the new iPad could potentially revitalize the slate market or else Apple may have to look for 2-in-1 iOS/MacOS solutions of its own. In light of another quiet iPad announcement from Apple on March 21st and the rumored upcoming iPad Pro news, we’d like to point out some recent industry trends that display how people are leaving tablets at home and using a PC to get real work done. In fact, according to IDC, the fourth quarter of 2016 marked the ninth consecutive quarter that tablet shipments declined, and vendors shipped 52.9 million tablets in Q416, a decline of 20.1 percent from the same quarter one year ago. Our take - the slate tablet market is oversaturated and continues to experience declining demand from end users. The 2-in-1, with larger screens in the 12- to 13-inch range, is offering a laptop first experience with the convenience of a tablet when needed. This is where our customers are asking us to invest and innovate across our commercial and consumer portfolios. Over the last year, Dell has expanded its mobile products offerings. With the expansion of Windows 10 adoption and improvements in product design, software and processor efficiency, our 2-in-1s and laptops are positioned to take advantage of the largest growth opportunities within the personal computing space. At CES in January, we added multiple new varieties to our 2-in-1 portfolio to fulfill both consumer and commercial customer demand, including the XPS 13 2-in-1, Inspiron 5000 2-in-1, Latitude 5285 2-in-1, Latitude 5289 2-in-1, and the Latitude 7289 2-in-1 featuring wireless charging arriving this summer. Of course, slate tablets will not disappear completely and they will continue to find a receptive audience among consumers and companies that need devices for purpose-driven applications like point of sale payments, retail and hospitality. But tablet-first devices will not find widespread adoption in the business world as PC replacements. CIOs and IT administrators have to consider much more than just the word “Pro” and visual appeal of a device when deciding which products to deploy among their workforce. Following are four reasons why slate tablets’ best days are in the past and promoting them as business solutions is a non-starter. · If 90 percent of your job comprises basic tasks such as writing articles, checking emails and glancing at the Internet, then the tablet probably suits your needs just fine. But most businesses require substantially more computing power to ensure a fully productive workforce. Tablets simply cannot match the PC’s processing power, flexibility and ability to facilitate productivity and turn creative thought into tangible results. · After several years of experimenting with tablets in the workplace, many of our customers have concluded that a “tablet-first” device is not a PC replacement nor a full-fledged productivity device. Small screen tablets are best suited as companion devices or for unique use-case applications rather than for general corporate use, leading to declining demand for 8- and 10-inch slate tablets in particular. Therefore, we’ve updated our consumer and commercial portfolios with detachable and convertible 2-in-1s that are an optimal blend of PC capabilities with the convenience of tablet mobility when needed. · There is a false perception out there that Apple devices based on Mac OS or iOS are more secure. That’s simply not true. According to a whitepaper published by Symantec (Apple Threat Landscape, February 2016), the number of new Mac OS threats is increasing year-over-year, and the number of Macs hit by malware infections have increased significantly – in the first nine months of 2015, the number of unique OS X computers infected with malware was seven times higher than all of 2014. · Dell Commercial PCs are the most secure with industry-leading endpoint security solutions that include strong encryption, authentication and advanced threat protection. In 2016, we released Dell Data Guardian and Dell Endpoint Security Suite Enterprise, a comprehensive endpoint security suite with Cylance technology that uses artificial intelligence and machine learning to proactively prevent advanced persistent threats and malware. With this solution, Dell commercial PCs will also come with a BIOS verification functionality which allows customers to ensure their device remains free from malware during the boot process. · The larger the business, the more challenging it is for an IT administrator to keep all systems updated, secure and serviced. Dell provides additional management tools and capabilities within its systems at no additional cost, while Apple requires the extra burden and cost of additional software. According to SpiceWorks’ 2017 State of IT Report, annual company revenue and IT budgets remain relatively flat again in 2017. Therefore, majority of IT departments are looking for ways to spend smart by identifying clever ways to save money while still meeting business needs. The Dell Client Command Suite’s free tools allow users to drive efficiencies in deployment, monitoring and updating. IT professionals can also easily configure BIOS and system settings regardless of their IT management console. Plus with Dell, you can manage tablets, notebooks and desktops exactly the same (unlike Apple where you would need different products to manage tablets and notebooks). Apple customers must purchase extra software to manage them whereas Dell provides comprehensive management tools with our devices. · As devices increasingly become competitive, support has become a key factor in bulk hardware buying. CIOs need a mature and unified approach to enterprise services. Dell Deployment Services, ProSupport andProSupport Plus for PCs and Tablets services can help cut costs and increase productivity across Dell hardware and software infrastructure. · With ProSupport Plus for PCs and Tablets, Dell is the first and only in the industry to offer proactive and predictive support on PCs enabled by Dell’s SupportAssist technology, making Dell a crucial partner in the Windows 10 migration. Currently, our customers spend up to 84 percent less time on technical support calls and take up to 58 percent fewer steps to resolve common hardware issues than key competitors. And our customers are thrilled. ProSupport Plus for PCs and Tablets has a 90 percent customer satisfaction rating so far this year in the US/Canada and 88.4 percent worldwide. · We know support is just one piece of the equation. Businesses also need to bring new systems online as confidently and quickly as possible. We currently have a 94 percent customer satisfaction rating for client deployment services which includes Managed Deployment and Configuration services (e.g. Imaging, Asset Tagging).